How does a turkey tell time? 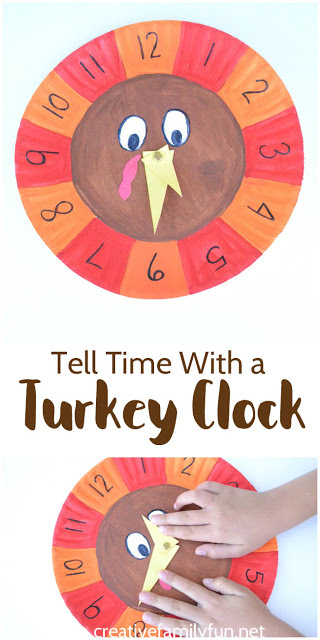 With a turkey clock, of course! Okay, okay… I know none of us are trying to teach a turkey how to tell time. But, I know plenty of kids that need to learn. 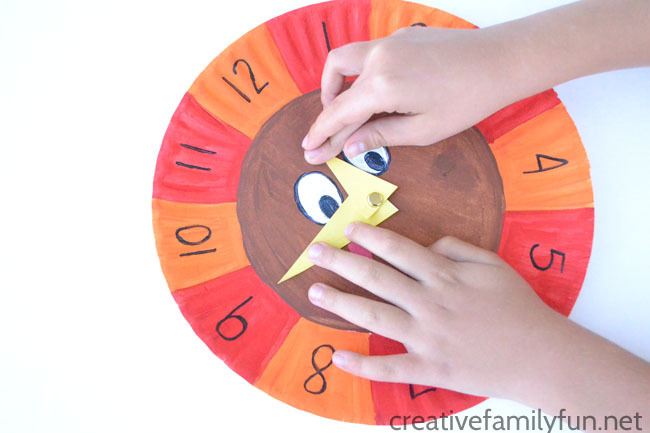 A Turkey Clock is a fun Thanksgiving math activity that will help your kids learn how to tell time. 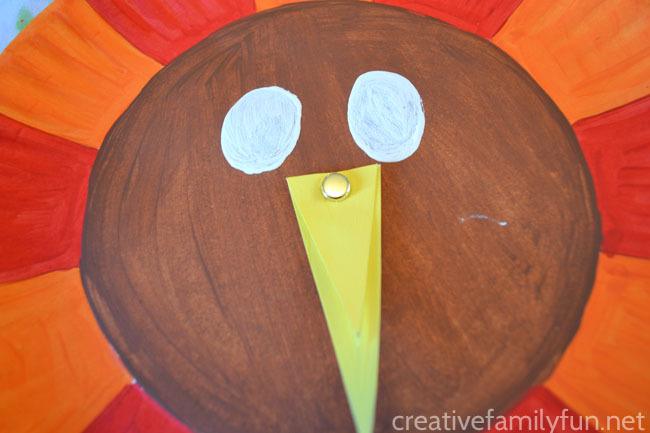 And, once you’ve made your clock, check out all of our fun Thanksgiving Crafts for Kids here. 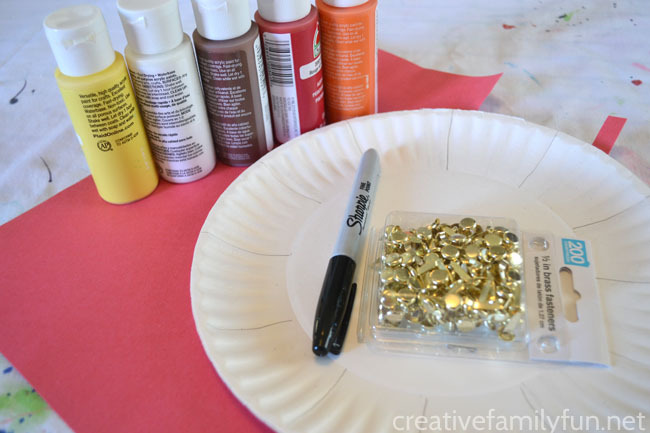 Let’s gather our supplies and get ready to make this fun paper plate clock. Use your ruler and a pencil to divide the edges of one paper plate into 12 equal sections. This will be your turkey feathers and the numbers on your clock. 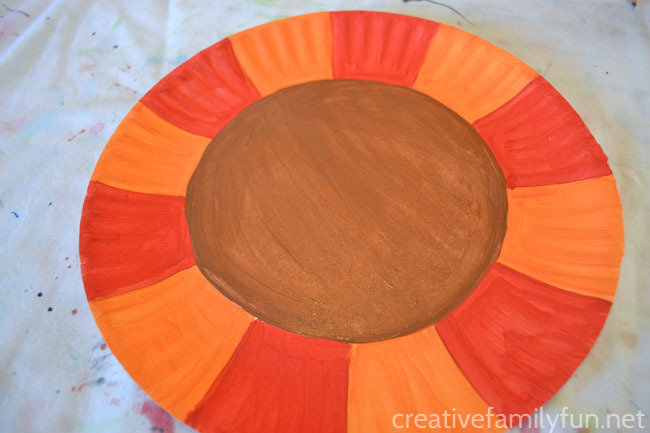 Paint each outer section in alternating colors of orange and red. Paint the round middle section with brown paint. 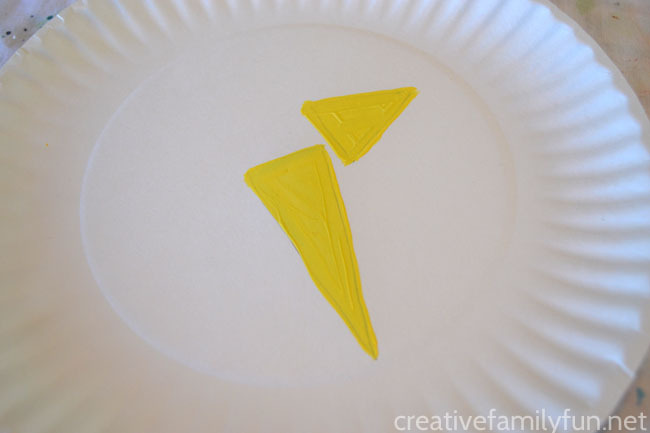 While your turkey is drying, draw two beak shapes on your second paper plate. These will be the hands on your clock, so you will want one beak to be longer than the other. Paint each beak with yellow paint. Cut your beaks out once they are dry. After the brown paint dries, locate the middle of your turkey plate. Put your brass fastener through the wide top of your short beak and then the wide top of your long beak. Attach your beaks to your plate by pushing the fastener through the middle of your turkey plate. Paint two white ovals above your beaks for the eyes. Use the red construction paper and cut out a small piece for the wattle. Glue this next to the beaks. Once all your paint is dry, use your black permanent marker to write your numbers on your clock and add the details to your eyes. Tell Time: Move the beaks to a specific time. Have your child read the clock and tell you what time it is. Move the Beaks to a Specific Time: Ask your child to show 3:00 or to show 6:45. Call out different times and have them move the beaks to the correct locations. Find Elapsed Time: Elapsed time is the amount of time that has passed. 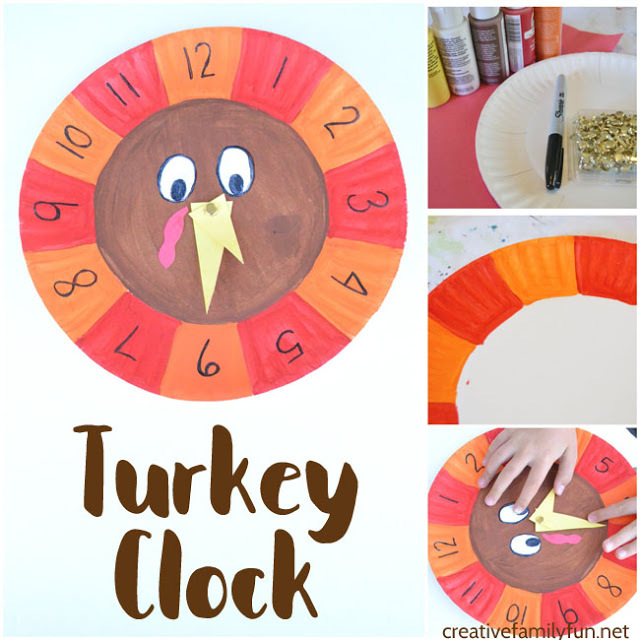 You can use your turkey clock to practice calculating elapsed time. Set the clock to a specific time, such as 2:00. Ask your child what time it will be in 30 minutes. Let them use the clock to figure out the new time. 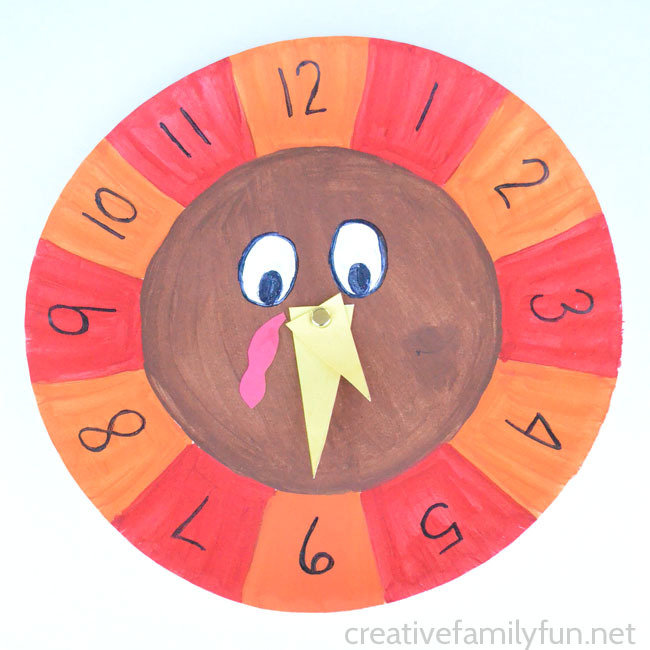 This Turkey Clock is a fun tool to use in the classroom or at home to practice telling time. It’s easy to make and a great way to get your kids learning.